Yep, it was one of those CB Bucknor kind of nights. 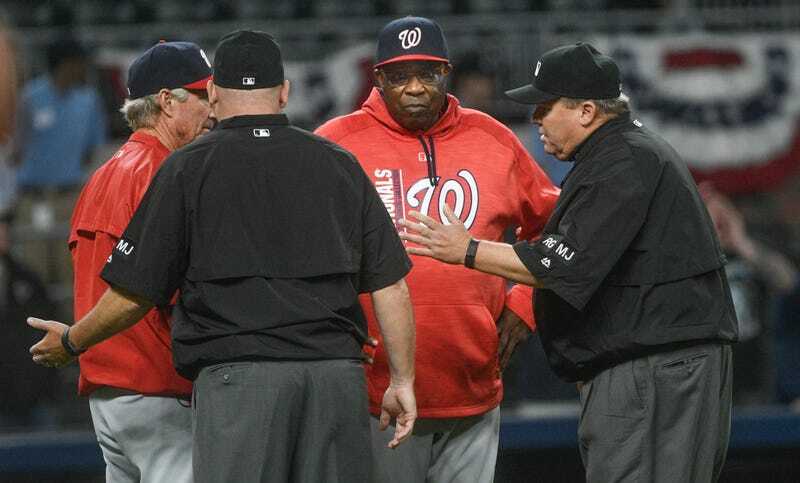 Bucknor, who has been named the worst umpire in baseball multiple times in player surveys, was behind the plate for last night’s 3-1 Nationals win over the Braves. Just where Bucknor thought that plate was is another story. Strike zones are one thing. The ending to this game, though...it’s something I’ve never seen before, and I’ve seen a lot of bad umpiring. Down two and with the bases loaded, Chase d’Arnaud appeared to strike out swinging against Shawn Kelley. You know what? I don’t even need to say “appeared to.” He struck out. He swung and missed. Everyone knew it. The Nats celebrated, and the Braves walked off the field, and the MASN broadcast went to commercial before the postgame show. The most inexplicable thing here was that d’Arnaud’s swing wasn’t even close to making contact. “It looked like he missed it by about eight inches and they called a foul tip,” Braves manager Brian Snitker admitted. “This is my like my 14th year in the big leagues,” Werth told reporters after the game. “You see a lot of things, but when it’s consistently not with the standards of the league, I think something needs to be done. I just can’t believe that every time it’s bottom of the barrel. Every time. I know I’m handcuffed here. I can’t say a whole lot. I don’t want to get suspended. But these games are serious. That’s the thing. These games mean a lot. The game is over there, and all of a sudden it’s not over. Congrats to the 21,834 people who paid good money to see CB Bucknor, and got exactly what they came for.